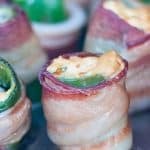 Bacon wrapped jalapeno poppers are stuffed with a cream cheese mixture and grilled to perfection. And because…bacon. You will not be disappointed. Disclosure: Cave Tools was kind enough to send a complimentary pepper roasting rack with coring tool for me to try out and share my thoughts with all of you. Welcome! 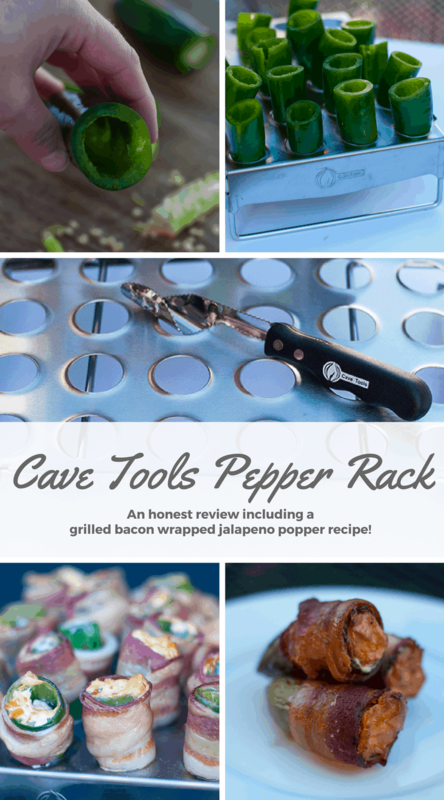 Today I’m sharing a fun grilling tool — the Cave Tools Pepper Rack with coring tool and a yummy recipe for grilled bacon-wrapped jalapeno poppers. And just let me tell you, I am not a fan of spicy and these poppers are far from spicy. My family is Norwegian and we joke that some of us find ketchup spicy. So don’t shy away from this recipe if you are the same way. First, let me introduce you to the Cave Tools Pepper Rack. 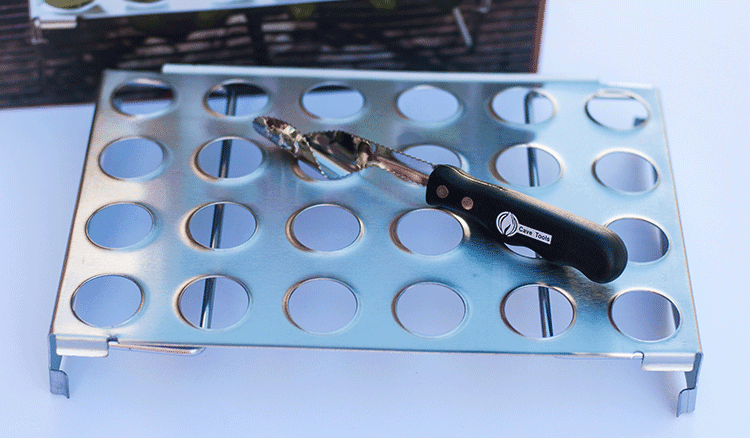 My husband and I love our grilling tools & this one we definitely enjoyed using. The set comes with both the rack and a coring tool. Plus a digital recipe book download. The rack is stainless steel with legs that lock in to place (so no wobbly legs falling over on the grill). It comes with 24 holes to make a good amount of peppers. It is built really well, I can tell you that. The peppers don’t stick and are easy to remove, which likely wouldn’t be the case making them direct on the grill. And it’s dishwasher safe for easy cleanup. Which is no doubt the best part of grilling. Great food, little cleanup. Let’s talk about the coring tool for a minute. 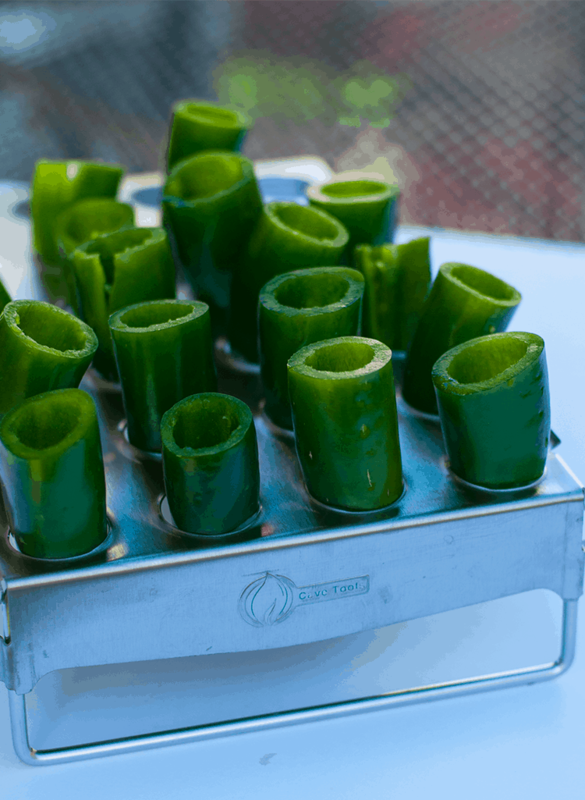 After you rinse, you use the coring tool to slice off the tops and take out the seeds and insides of the peppers. The tool works really well, I was impressed. But I do want to mention — you’ll want to buy medium to large peppers or the tool may break through the small ones (you can see one in my pictures that is torn). This will also make sure the peppers don’t fall through the holes in the rack. This set would be a great idea for a Father’s Day gift or birthday present. 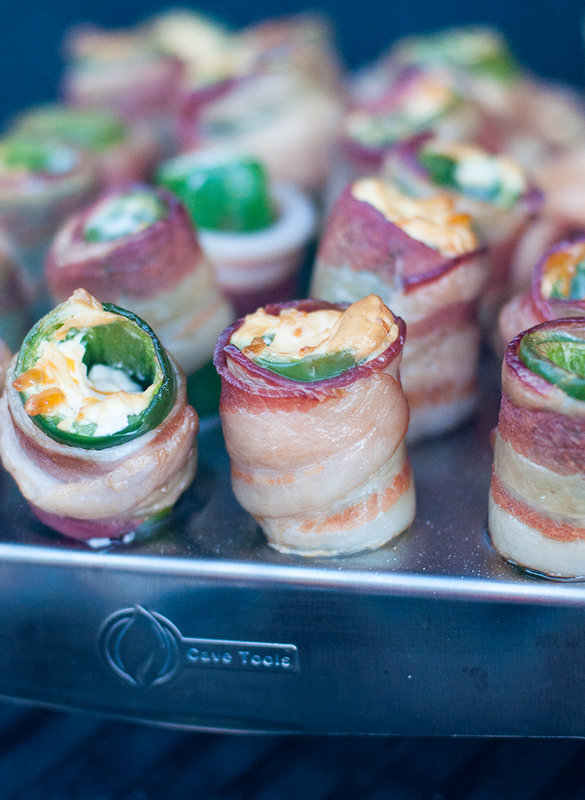 Now for the recipe…bacon wrapped need I say more. 🙂 This recipe works really well with the pepper rack and coring tool. Again, I recommend buying medium to large jalapeno peppers. Wash the peppers well and cut off the tops with the edge of the coring tool or a knife. Use the Cave Tools pepper coring tool to remove the insides and seeds. Mix the sour cream, cream cheese, and cheddar cheese together in a small bowl. Stuff each pepper with the cream cheese mixture. Wrap each pepper with a half a piece of bacon. Line all 24 peppers in the Cave Tools pepper rack. Smoke for 1 hour. Then grill at about 350 degrees for 30 minutes. Have you used any of the Cave Tools grilling products? I’d love to hear about it in the comments. A delicious grilled appetizer. And if you aren’t a fan of spicy, these poppers aren’t spicy! This recipe is made in a wood pellet grill, but you can easily make them on a gas grill as well. Cut off tops of peppers with the edge of the coring tool or with a knife. Mix the sour cream, cream cheese and cheddar cheese together in a small bowl. Stuff each pepper with the cream cheese mixture. Line in the Cave Tools pepper rack. Cook at about 350 degrees for 30 minutes. 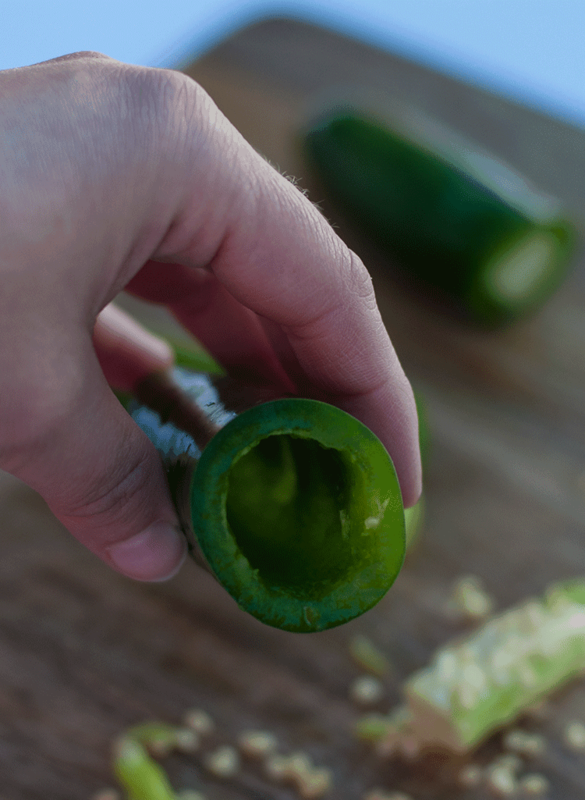 Pick medium to large jalapenos to make sure you don’t crack them when coring. And so you have plenty of room inside to stuff the cheese mixture.